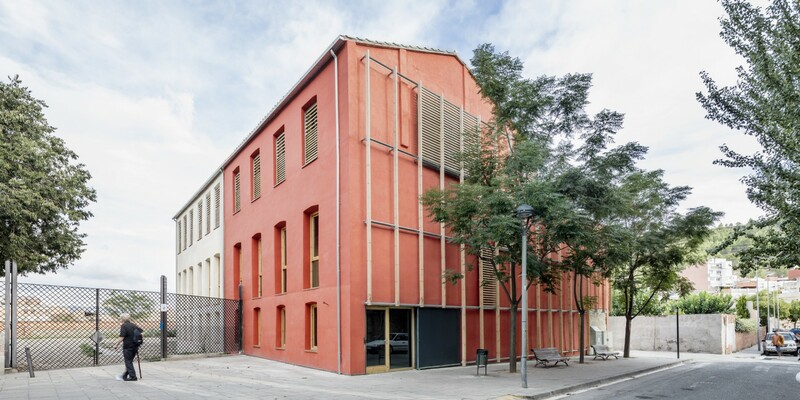 Reclamation of the old Bella and Bernades factories in Barcelona’s Igualada tannery district is an urban regeneration project by taller 9s arquitectes. In the new leather centre, taller 9s arquitectes brings new life to the socioeconomic system and historic area of Igualada. taller 9s architects’ conversion of two former Bella e Bernades tanneries in the Rec tannery district in Igualada offers an interesting example of urban renewal. Located in the province of Barcelona, Igualada developed a flourishing industrial district starting in the late nineteenth century, located to the south of the historic town centre, by the Anoia River, on what used to be farmland. Still known as Rec, the Catalonian name of the canal that crosses the area from east to west, the district saw a period of decline in the last century, but the municipality continued to invest in the district as a local area of excellence, and its factories became architectural heritage sites. About thirty leather goods companies still work here, and the city has begun a process of protection and promotion of the memory of the tannery industry by renovating the old tanneries and opening Museu de la Pell d'Igualada i Comarcal de l’Anoia. Regenerated as venues for temporary exhibitions, trade fairs and events, the Rec tanneries now allow the district to survive not only as a dynamic, creative, attractive centre but as a strategic landmark for the European leather goods industry. In the competition on invitation, taller 9s arquitectes were asked to present a project for reclamation of two former tanneries, Bella and Bernades, facing onto the Rec. The City asked the architectural practices invited to participate in the competition to come up with a project with a budget of 750,000 euro (including VAT) for a redevelopment programme in three parts: a centre that would become a landmark for professionals and designers in the European leather goods industry, a public office for promotion of the district, and a coffee shop accessible directly from the street and connected with the museum on the other side of the courtyard to the north. On the corner of Carrer del Rec (where the reclaimed canal comes back to the surface a little way along the street) and Carrer del Dr. Joan Mercader, the two abandoned Bella and Bernades blocks are examples of industrial archaeology which is not particularly noteworthy but, like many buildings in the area, reflect the architectural features of a landscape of memory with a special place in the city. In order to stick to the budget set by the municipality, taller 9s arquitectes worked on the idea of performing only the minimum necessary to consolidate the structures and adapt the interiors, with the idea that the process would serve as a model for future redevelopment in the area. What used to be two buildings side by side is now a single block, in the same colour of brick as the old tannery. The windows on the north and south walls bring order to the renovations performed on the building over the years, installing new wooden frames and sunbreaks. The building’s outer cladding is built using a clear impermeable mortar that has earned the building level B European energy certification without performing any work directly on the brick walls. The plant’s big interior was spanned by girders and had bare brick walls, which have been consolidated and restored to their original appearance. The slope of the roof and the layout of the rooms have been maintained to preserve the memory of the tannery wherever possible. The reinforcements, such as the beams in the brick walls, have not been hidden but revealed with all their bare necessity, like all the new installations. Moreover, to allocate the hygienic installations and wiring, which did not suit the historic original spaces, the architects designed a series of boxes superimposed on the walls, which thus did not have to be modified. Like the structures of dryers for hides in the tannery, these rooms within rooms, with their walls of reclaimed wood assembled dry and easily removable, separate the new from the historical, distinguishing that which is structural from that which is temporary and associated with temporary functions. In view of the building’s change of function from workshop to event space with offices, taller 9s arquitectes’s project concentrated on recovery of the structural cladding, making it become a container for new functions, from the point of view of the interiors. On the outside it is a landmark, tracing an axis in the city with the nearby leather museum and using red and ochre as another element of the district’s architectural memory. 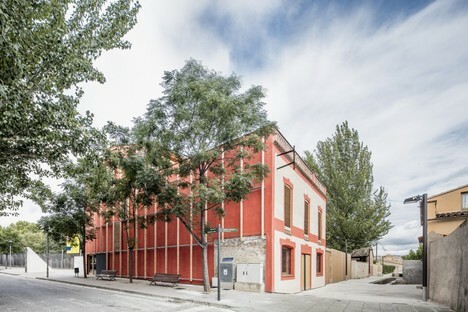 The western wall on Carrer Dr. Joan Mercader is closed, like many of the walls in this industrial area, but application of a grid of metal and pine (the wood used in the interiors) ennobles it and transforms a buffer wall which was originally unused and unfinished into a façade that interacts with the street and its surroundings. This grid is used to conceal air ducts on a number of levels and to put up posters announcing events in the neighbourhood. One of these is Rec.0, a festival held twice a year in which the old factories and tanneries are transformed into temporary shops.